We are having such amazingly gorgeous weather this autumn, it seems criminal not to be out in it at every opportunity. If this is an effect of global warming, bring it on! Unfortunately, work gets in the way for most of the week, so one is restricted to local spots for a daily (or so) constitutional, but at the weekend, one can take advantage of the gratifyingly low petrol prices and wander further afield. Thus it was that we dug out our pamphlet of walks in the Cévennes and found one an hour or so's drive from home. I packed a picnic (flageolet bean houmous, buckwheat crackers, lettuce, apples) and we drove to the starting point at mountain village of Saint-André de Majencoules thirty or so kilometres south of Mont Aigoual. My DB doesn't like walking on a full stomach, so we packed our lunch in his backpack and set off walking through the picturesque village. It sits strategically on a rocky overhang which gives spectacular views across the valley. You can see the terraces of sweet onions - 'l'oignon doux des Cévennes (AOC)' - which were originally grown for personal consumption but then became commercialised in the 1950s when the silk worm industry died out due to severe winters which killed the mulberry trees. The village has suffered, like so many in the Cévennes, from desertification. Its population of around 550 today was three times higher in 1913. At that time, it had forty artisans and tradesmen including two blacksmiths (maréchaux-ferrant), six shoemakers, four tailors, three hairdressers and eight grocers. We were following yellow markers on the 'Sentier des Rouquis' which takes you through a landscape of granite rocks, forests of chestnut, holm oak (chêne vert) and other robust trees; the village of La Rouviérette, and along a crête which overlooks the village. It's a 'facile' walk which means it's accessible for everyone (although they don't mean wheelchair users, pushchairs or those with weak knees, and it's best not to wear flipflops...), is less than 16km and no more than a 400m climb. We are not up to the 'moyen' level yet, which is a shame because the Cévennes Tourist Office organises some really cool walks, like this one on Oct 31 which has as its theme the diversity of flora in the Cevennes. You get a lunch of local products as well as explanations about the plants you encounter as you walk, their rarity and the uses man puts them to. We followed the deserted road as far as the next signpost where we turned to climb up towards the hamlet of La Rouviérette through a chestnut tree wood. The narrow road, at this time of the year, is strewn with chestnut tree leaves and fallen chestnuts. Anyone wanting a cheap dinner would be able to have their fill! Opposite the picnic table was a staircase cut into the granite which takes you up into the châtaigneraie (chestnut grove) and down to Saint-André. The pamphlet relates the story of one old man who used to work in the silk textile mill further down the valley in Peyregrosse. He walked down in clogs carrying his lunch in a billy can, worked for nine hours and then walked back up at night, presumably in the pitch black. The châtaignier was a vital part of the local diet until the middle of the twentieth century along with the potato. Villagers also cultivated chickpeas and wheat. We learned about the clède which is now a ruined building in the village of La Rouviérette, but was once where chestnuts were laid out to dry. They would be put on a griddle (claie) and a small fire would be lit beneath. When the châtaigneraie was abandoned, the inhabitants started cultivating ferns (fougère aigle) which was used for bedding and animal food. 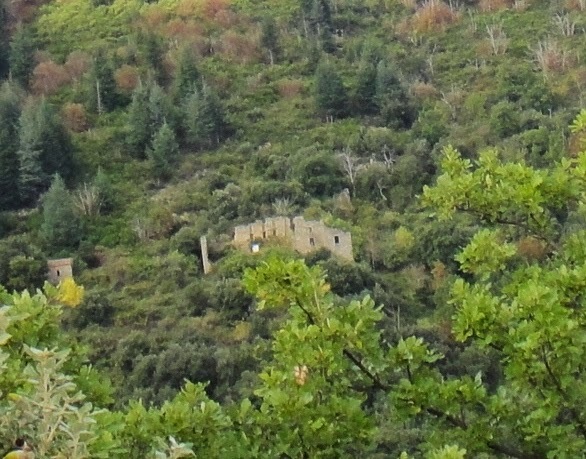 La Rouviérette is on the transhumance route to Mont Aigoual. Now only a couple of herds still pass through. La Rouviérette. Is that a sheep shed under the arch? Still on the road, we came across a collection of five blue tubs, the sort that contain fertilizer. They were connected together in a basic manner by a series of tubes. Another tube guided water that came out of the rocks behind into the first tub. When it was full, the overflow was carried by a second tube into the second tub, and so on. They were all pretty full - it's been very wet. We came to a signpost 'Les Suels' after a gentle but persistent climb, which marks the col (pass) and the start of the crête (crest). The air was clear and pure, and the fragrances from the damp earth, the herbs and other vegetation were delicious. Les Suels seems to have been a grand old building, now a ruin, which was inhabited up until 1945. The girls who lived there (according to the pamphlet) used to go down the path to school which must have been about 2.5km, accompanied by a tame boar that followed them like a dog. It came to collect them at the end of the day too. Apparently there were fewer wild boar at that time and so there were only three or four hunters. We found a fair amount of boar activity along the crest - stirred up earth showing where they slept for the night. They have become so numerous now they are a menace and have to be culled. 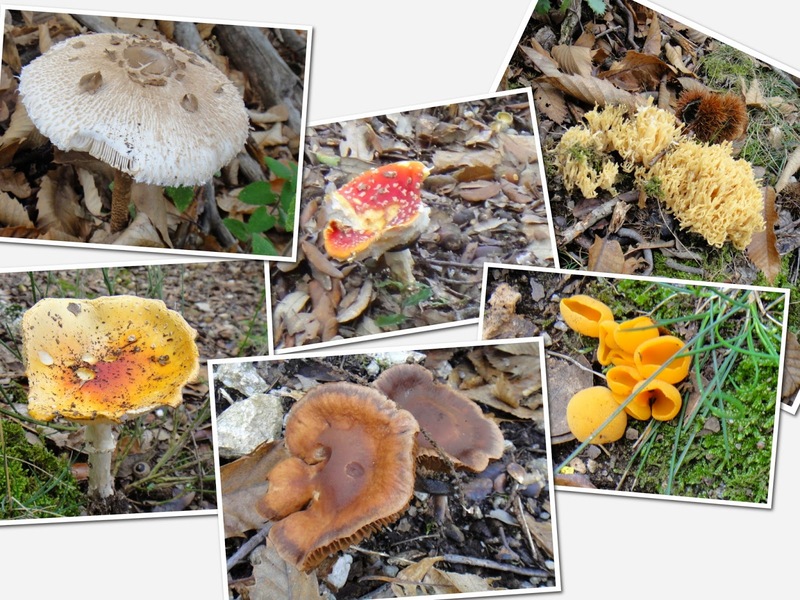 I don't know if they were looking for mushrooms, but we certainly found quite a few. We didn't pick them though as we know nothing about mushrooms. Up on the col, it was amazing how the sound of the traffic on the main road some 600m below rose up as a constant drone. We were following the Rouquiers path which runs along the crest and then goes down to the south side of Saint-André. The descent is a lot more brutal than the ascent; the path a perilous track of loose rocks, hidden tree roots beneath the fallen leaves and large boulders that need careful navigating if one is not to twist an ankle or go careering off over the side of the mountain. Is it really the path taken by those girls, in the dark of winter mornings and evenings? One false step on a dark winter's evening and you'd be over the edge in a jiffy. We arrived back at the car after nearly 6km of an exceptionally pleasant trek - gorgeous views, lovely smells, peace and quiet, pretty villages, and interesting history. Happy me enjoying the Great Outdoors wearing a back-to-front bumbag and my zumba outfit. We finished off the day back in Montpellier with an exceptionally delicious bottle of red from Domaine de la Jasse - the Black Label cuvée. Smooth, beautiful and elegant, it was a fitting end to a fabulous day. Cheers! You have painted a wonderful picture of a great day's walk. It's got me thinking, now that Rory is away, Dougie and I should try and make more of our days together. I think I will see what local walks we could try round here. No hills, which is one advantage but then only big sky views. If I'd known about the chickpea link I'd have rushed out and bought some... natch... but I'd already soaked and cooked the beans, so beans it was. :) Very good they were too, with garlic, turmeric, piment and Nigella seeds. I'm glad you like these posts. It is a beautiful area, and we're lucky to have so much variety so close to hand. I've just finished a novel, Trespass by Rose Tremain, set in the Cévennes. She writes about a village called La Callune and a place called Ruasse - are these fictitious? My comment has come up with the wrong identity! I'm Dumdad although you also know my real name as we're FB chums. I had a lot of difficulty posting this comment. There are sites where I have trouble posting comments too, it's quite bizarre. Gorgeous weather indeed. Things are slightly different in London (British understatement). I am even starting to miss France. Lovely photos of you a la Zumba with de backwards bum back - have you grown out your fringe? I would not have recognised you - or maybe Renee Z paid you a visit (it's catching!) That village on the cliff is ridonculously choccy box perfect and idyllic, you are so lucky to live there in a walk's reach of these villages. What a super walk through gorgeous countryside, though sadly my weak knees would rule it out for me. :( I find the landscape and architecture of the Cevennes enormously appealing whenever you post about it. You really are lucky to have them almost on your doorstep. PS I always wear my bumbag like you, though DD wears hers facing forward.